Why isn’t my website attracting more customers? If so, you’re probably not alone! Out of 100 local accommodation websites we recently surveyed, 73 of them are letting their owners down in one way or another! This is a serious problem and one that we want to help put right. Creating a website that converts visitors to customers isn’t difficult, but knowing where to start and what to do, isn’t always obvious. By the end of this article, plus the others we have planned for this series, and providing you implement some of the suggestions, we promise you a better website and a more successful business because of it. 1. Invest in a well-designed, responsive, customer focused B&B website. Result: It’s easy to click away and look elsewhere. Result: Give up and click away. Result: Click away and never visit this website again. Visitor feels: They have no standards. Result: Click away and never visit again. Visitor feels: Frustrated and impatient. Result: Click away and look elsewhere. Result: People are impatient so they click away and book where it’s easy. 2. Use your B&B website to communicate, it’s not a brochure! It’s important to remember that your website is not an online brochure. It’s a two-way communication tool and the most powerful way for you to interact with your customers 24/7. Therefore, don’t just ‘set it and forget it’, use your website as a communication hub. Update it regularly with news, images and special offers so your visitors have a reason to keep coming back and booking your rooms. 3. Use social media but do not run your business on it. First of all, your website, how it looks, how it works, the message it conveys and the image it portrays, are all under your control. No social media site will ever give you this amount of control. Secondly, staying on a social media site such as Facebook isn’t guaranteed and should you ever fall out with each other you risk loosing your internet presence entirely! Basically, never run your business solely using services provided by a social media website because one day they may throw you off or go out of business… then where will you be? Make sure your website uses high quality modern graphics and excellent photography. Why? Well, the image and feeling that your B&B website portrays to your visitors, will directly influence their booking behaviour. Amateur photographs, dated graphics and swirling logos put people off. Why lose business because of cheap DIY graphics and mobile phone images? Hire a pro, stand out from the crowd and watch your bookings increase. Keep your website’s functionality simple, obvious and easy to use. Visitors may not be as internet savvy as you, so design your website with this in mind. Make it obvious what you want your visitors to do next by providing clear and obvious links and buttons. We call them ‘Calls To Action’ and they should be used to funnel your visitors to your booking facility, phone number or enquiry form. If you update your website regularly via a ‘Blog’ or ‘Latest News’ facility, you will keep visitors coming back for more, whilst providing search engines with more ways to send customers to your website. Apart from adding to the number of ways a customer can find you via a search engine, news and blog posts can also encourage visitors to stay with you at different times of the year e.g. bluebell walks, festivals, events, Christmas and New Year. If you don’t tell visitors why and when they should stay with you, how will they know? Start a Blog on your website today, post good content and communicate with your visitors – it’s worth it. Set up a newsletter signup form on your website so you can keep in touch with your customers. Use your newsletter to inform subscribers in advance of what’s on near you to encourage bookings. How about sending out an annual event planner so guests can book their holidays with you well in advance. Whatever you do, permission based newsletters are one of the best ways to speak directly to your customers. Make sure you offer an online booking facility because visitors to your website will be very disappointed if they can’t book online when they have found their perfect B&B! There are many services which enable you to take bookings very easily and failing that, it’s quite straightforward to build your own booking calendar into your website and cut out the middle-man. 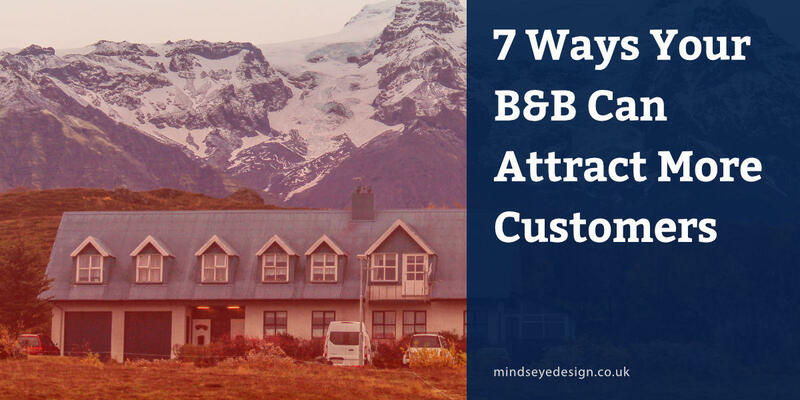 Either way, your B&B customers will expect to book right away if they like what you are offering. There are dozens of ways to attract website visitors to your bed & breakfast business and get more ‘Heads In Beds’. The 7 above are are just the tip of the iceberg! Implement as many as you can to get the most from your website and improve your B&B business.